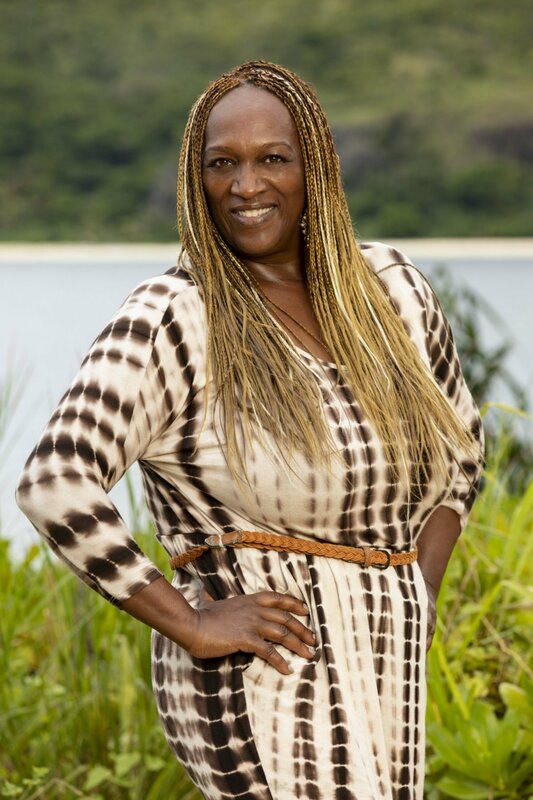 Natalie Cole was eliminated from Survivor: David vs. Goliath after the entire cast was evacuated due to a storm during Wednesday night's Survivor Season 37 episode on CBS. During an exclusive interview with Reality TV World on Thursday, Natalie talked about her Survivor experience and seemingly volatile relationship with many of her fellow castaways. Below is the first portion of what she had to say. Reality TV World: Would you say you were blindsided? Did you expect the vote to be an easy one and Lyrsa would be going home? Natalie Cole: Nope, I knew it was coming. I knew I was up. Everything -- all the signs -- pointed to that, and at that point, I was like, "Okay, it's me." That's why I didn't give out my jacket. [Angelina Keeley] was, in my thinking, the ring leader. She set it up. I didn't trust Angelina. She was very sneaky the whole time we were on the island, so I was very clear that it could possibly be me going home that night. And this was also why I'm like, "My jacket?!" (Laughs) She's lucky I didn't even make a comment about it. I really had to hold back on commenting on the fact she had the audacity to ask for my jacket. Reality TV World: So then were you surprised to find out she actually voted for Lyrsa and not you? Natalie Cole: No. I thought that was a setup. I immediately thought, "Okay, Lyrsa got two votes. Somebody is playing games." I thought it was Angelina but I wasn't sure until after it aired. Reality TV World: Well now that you know Angelina voted for Lyrsa, do you think it was a sincere vote -- that she ultimately decided to have your back -- or a pity vote because she thought writing Lyrsa's name down would better her chances of receiving your jacket she so desperately wanted? Natalie Cole: I think it was an actual crafty, sneaky way. She thought she was going to fool me by not voting for me and voting for Lyrsa, so I would -- and that's why she asked for the hug. But I was immediately able to read it, because again, I didn't trust Angelina. She was very sneaky; she was very untrustworthy out there. I also saw it coming before we left for Tribal because she was having a conversation with Lyrsa and then [Nick Wilson]. And then Lyrsa peeled off and was whispering and then [Mike White] was whispering to Nick. I was very clear on what was happening. And at that point, I no longer wanted to fight it and I couldn't fight it because what Angelina and Mike did as soon as Lyrsa and Nick entered the camp was to update them on all the drama that had happened before they got there. So my error, if anywhere, was not getting to Nick and Lyrsa and saying, "Look, I'm willing to jump ship on the Goliaths." Why did I not do that? Well, one thing is I had committed to being "Goliath strong." What I didn't realize is I was the only Goliath left on that island. I was playing with a bunch of Davids in the end! There's no question in my mind about that! Reality TV World: So it sounds like you saw Mike's betrayal coming. What was your relationship with Mike like out there? Did you realize he harbored such negative feelings towards you during the game? Natalie Cole: Definitely. Mike was resentful because [Jeremy Crawford] got voted out and I stayed. And Mike may have even found out that I was the reason Jeremy got voted out, which they didn't clearly show in the episode. I got in both [John Hennigan]'s head and Angelina's head about the comment Jeremy made, and I blew that comment up, telling them about how their wives and husbands would receive that. And I said, "Look, the way we can reverse this is to unanimously vote Jeremy out. We have to get everybody onboard for this vote." So I set it up for Jeremy to go out! And in his exit interview, he's still clueless because he thought that I thought I was going home. But I set it up and I watched my magic happen for the next two hours to come, and I could confirm they were, in fact, successful based on the reactions I was seeing from different people -- [Natalia Azoqa] included. So Mike was pissed from that day forward because he was in love with Jeremy and Jeremy was in love with him. So I knew I could never get Mike. Angelina was not trustworthy (laughs) and the other two were Davids, so I'm with Davids now! I played the best hand I could play. I was not blindsided, and no, I'm wearing my jacket today as a matter of fact! Reality TV World: So I think it's safe to say you have no regrets about keeping your jacket. (Laughs) Just to clarify then, did you personally think Angelina and John were in a showmance? Natalie Cole: Jeremy made the comment and all I did was exploit the comment. As to whether confirming or validating or denying what went on with John and Angelina, only they know what happened. That's outside of something I would do whether I'm in the game or out. So, I have no comment on that particular aspect. But the importance of the comment to me was it represented a crack in the Goliaths, and I exploited it. Reality TV World: Could you give me a couple examples of what led you to believe Angelina was sneaky and untrustworthy? Did you catch her talking about you behind your back or something? Natalie Cole: Yeah, I was able to verify a couple of lies she told. Angelina was feeding me information, so I could not listen to her, but it was a big effort to decipher what was true vs. what was not. Because you only have limited information to go by. For instance, she came to me one time and said, "Why is it only you and I out here working and you have this showmance there out in the ocean frolicking?" There was kind of no reason for her to say that, because that was [Kara Kay] and [Dan Rengering] at the time. Kara was her girl. So she told me certain things about certain people that I thought, "Huh, that's your girl, and you're coming over here spilling the tea to me, which means I can't trust you either, because they are pretty much convinced they can trust you. And I see you're not trustworthy." For instance, [Alison Raybould], I told them, "Let's go after Alison. She's the hit." And I gave them a number of reasons why I thought we should go after Alison. And Angelina acted as if she was going to go forward with that and that's what we were going to do, and blah, blah, blah, and then she doesn't know I have an ally -- John and Dan are my allies. So I hear from John that's not what's happening. So I was able to confirm on two, if not three, occasions that Angelina was a liar and not to be trusted. However, I was also able to confirm Angelina told me the truth about a couple of things. When I felt, "I'm it. They're coming after me at the first vote," I already knew that, but Angelina confirmed it. So sometimes she gave me good information and sometimes she gave me bad. She was like an informant that's going to the police, and sometimes they tell the truth and sometimes they mix it up and you have to really decipher what's legitimate and what's not. I found her to be that way -- very crafty. Be sure to check back with Reality TV World soon for more from our exclusive Survivor interview with Natalie Cole.